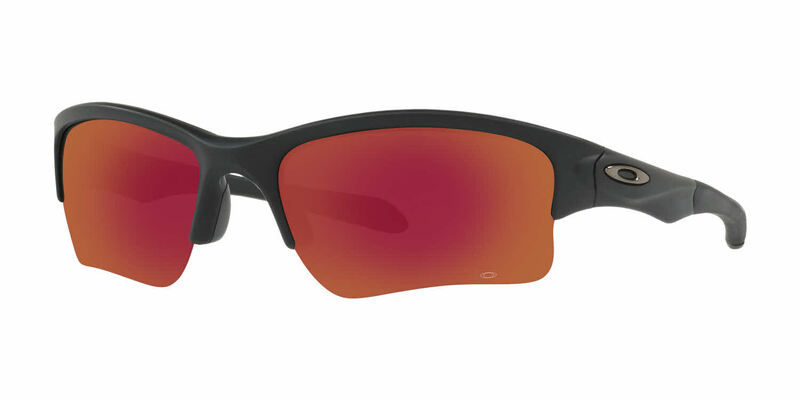 Oakley Quarter Jacket Prescription Sunglasses are made especially for kid's faces and will give full protection during sports and outdoor activities, while also correcting their vision. Semi-Rimless frame made from O Matter® - a patented lightweight synthetic from the Oakley labs; made to be impact and stress resistant, guaranteed to stay comfortable all day. Temples and nose pads feature Unobtainium® - a material invented by Oakley that increases grip with moisture and prevents sliding when exposed to perspiration. The fit is perfect for my narrow face, but the best part is how well you can see with these. I've had other prescription sunglasses but you can use these indoors, if you want, without any problems whatsoever. The optics on them is incredible. This is my second pair in the last six years. Frames fit great on small/narrow faces. Lens shape is good for sports activities, as they do a good job of blocking wind and particulates. The frame is called sky blue but appears a bit darker than that, which I prefer. Advise cleaning lenses as gently as possible since the 'ears' on the lenses are prone to fail after a few years if subjected to too much stress. Everything arrived as expected. My son loves his new Oakley sunglasses. These are perfect for our 10 year old son who plays baseball.